This colony was found in King's Canyon, Tucson Mountains, Saguaro National Park West, Pima Co., Arizona, USA. February 2012. 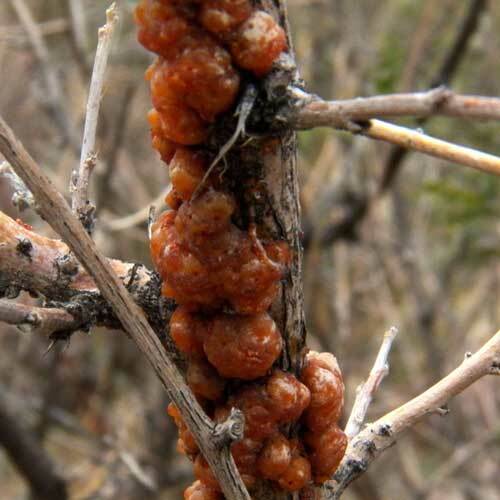 There are a number of Lac Scale insects species that might be found within the Sonoran Desert. Superficially they all look very similar - like glistening blobs of hardened shellac arranged along twigs of woody shrubs. Each species is quite specific as to the host tree or shrub used. Tachardiella fulgens is to be found on stems of the woody shrub Coursetia (Coursetia glandulosa). Not every shrub examined will have these scale insects present. In deed it may require searching dozens or hundreds of these plants before one of the conspicuous colonies is spotted. The hard material surrounding these bugs is a byproduct of the sugary sap that bugs take up from the plant's stems through their piercing-sucking mouthparts. It protects them from the elements and from some predators. The hard coating around lac insects has been used by people for millenia as a sealant and as a natural adhesive. Some species of lac scales have brightly colored pigment in the lac that has been used for dying fabrics. Some kerriids are significant pests of orchard crops.